Kowhai Guys are all safety conscious. Having safe workers is important for you too - how would you feel if someone injured themselves while working on your house or even worse became a fatal statistic. For this reason we fully support improved safety requirements when working at heights. It may cost a little more to have scaffolding installed but it brings piece of mind for everyone. 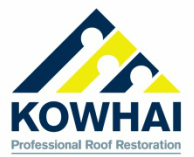 The Kowhai Roof Coating System is a complete paint system, designed for that particular type of roof and has been formulated to provide the best adhesion to that surface, while providing the longest possible protection for your roof. Each of the Kowhai Roof Coating Systems are formulated using the latest 100% acrylic technology, to ensure protection from the New Zealand weather conditions. YES – if your roof is suitable to restore, dependent on the age of the roof, it can extend the life of the roof at least a further 15-20 years and will renew its appearance to as new. NO - if the roof is leaking and/or has become extremely porous, has faulty laps, mortar has deteriorated, rusting etc, only re-coating of the roof, is not the answer to stopping the leaks. If the roof is very old and has considerable erosion or surface weathering, these areas of the roof will most likely need to be replaced, as they will be unsatisfactory to re-coat. Roof replacement – when not to restore? In severe cases of a pitted or eroded roof, particularly if it has become extremely porous (absorbing water) through age. Any roof material type where the product is beyond its useful life. Metal tiles and/or long-run metal roofing with severe rust requiring significant costly repairs (if in fact repair is possible) to make the roof watertight e.g. the cost to carry out repairs proves to be uneconomical. The substrate (structure) of the roof is not ‘fit for purpose’ i.e. the substrate has deteriorated to such an extent it is no longer sound. If it is unlikely repairs and re-coating of the roof will increase the life of the roof beyond a further 5 years. If the cost to restore is uneconomical in comparison to the cost of replacement with a new roof. Why not do a DIY job? Inexperienced homeowners need to be aware of the risks of climbing up and walking over their roof – not only the risk from a fall at height, but the risk of damaging the roofing material. Never walk on ‘brittle roofing’, skylights or clear sheeting. ​Avoid the hazards by leaving to an expert. Problem: Cracked or broken cement mortar bedding to the ridge and hip capping. Solution: The capping should be rebedded or repointed. Problem: Cracked or broken roof tiles (sometimes it’s just one tile). Solution: The individual roof tiles should be replaced. Solution: The displaced tiles should be put back into their proper position. Problem: Blocked drainage channels under the ‘sidelaps’ of individual tiles. Solution: Any build-up of dirt or debris should be removed. Problem: Flashings blocked, damaged or displaced. Solution: These problems should be corrected. Problem: Blocked gutters (including valley gutters) and downpipes. Solution: These should be cleaned out.